'Film Festival' (Keith Keppel, R. 1992). Seedling# 84-66A. Tall bearded, height 35" (89 cm), Early to midseason bloom. Standards rose buff (M&P 4-G-8) ground,blended and suffused dahlia mauve (53-D-9) to bacchus (53-J-4); falls peachy cream (9-B-4/5) ground bordered greyed mauve (46-H-3), darker greyed red purple (55-E-10) hafts; beards navajo (10-C-12) to tomato red (3-I-12); pronounced musky fragrance. 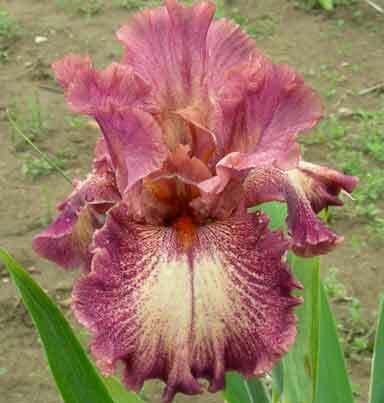 'Rustler' X seedling# 81-122K: ('Gigolo' x 'Queen In Calico'). D. & J. Gardens 1993. From AIS Bulletin #289 April 1993 Introducing FILM FESTIVAL (Keppel) TB EM 35" (Rustler X (Gigolo x Queen in Calico)) Blended rose, raspberry and strong raspberry carmine plicata, with creamy salmon-buff ground. Beards burnt orange to tomato red. #84-66A. $35.00. Keith Keppel. JPG FilmFestivalSI.JPG manage 322 K 10 Apr 2019 - 15:41 Main.TLaurin Photo by Sandy Ives.